This was a frustrating process for me, but I finally got it. Watch this video. It’s good and may give you everything you need. If not (there were a few extra things I needed to do) read on. Goto http://files.minecraftforge.net/ and download the ‘Installer’ for the most recent recommended version (1.6.4 at this time of writing). To skip the adds, click the ‘*’ beside the word ‘Installer’ on the ‘1.6.4-Recommended’ and download the jar file (it will save to your downloads directory). The next thing we are going to do is save your current minecraft configuration, before blowing it all away with the new minecraft forge client. Then type in exactly exactly what you see below into the textfield and hit the ‘Go’ button. This will take your to your minecraft application directory where your profile is stored (sorry, I forget to mention you will need to install minecraft on your Mac first before installing forge). Once there drag and drop these files and folders to your desktop. Then blow everything else away in the directory. Now start your minecraft application. This is going to download the latest minecraft version. Now here is where things differ from the video. If your minecraft client version (1.7.3), is different from the latest forge version (1.6.4), it’s not going to work (at least not yet). We need to create a 1.6.4 profile (the same version as forge) and then things will work. So if your latest client version differs from the forge version, create a new profile matching them up. For example to to create a 1.6.4 profile, click ‘Profile Editor’ at the top of your login screen. Then file in the profile name (pick whatever you want, maybe put 1.6.4 in there so you know the version), and then select ‘release 1.6.4’ for the Use Version, and then ‘Save Profile’. Now you have a compatible client that is going to work with your forge! No you can go back to your login screen, select your new 1.6.4 profile, and login. Click ‘Quit Game’ and shut down your minecraft launcher (Command-Q) or right click quit in your application toolbar. Drop the files we dragged to the desktop earlier, back into the minecraft application folder we deleted everything from earlier. 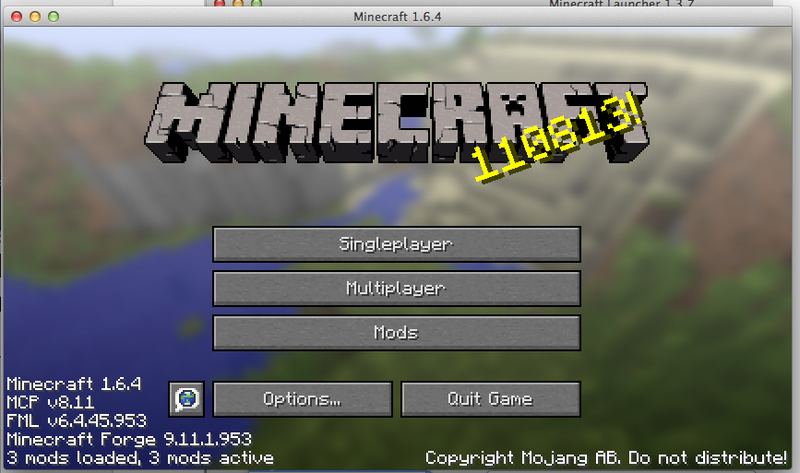 Then double click your minecraft forge jar file that we downloaded at the start (downloads directory). We are almost there! Click ‘OK’. 5. Create client forge profile. Open up minecraft. In the profile areas, a profile option should now appear! Select that. Click the ‘Play’ button. And congrats! You should be in. You can tell your are running forge by the data in the bottom left hand corner. Forge mods go in the ‘mods’ folder in that directory we where looking at earlier where we did all our profile stuff. This is where you put your forge mods. That’s it for now! Happy forging!